The Moto G4 is about to launch in the US on July 12 for prices starting $199.99. However, you can get it much cheaper today if you are an Amazon Prime member and you don't mind seeing ads on your lockscreen. How much cheaper? How about $75 less? Yes, that covers 75% of the cost of a yearly Prime membership and puts the Moto G4 at a ridiculously cheap price. This is possible thanks to Amazon's newly announced Prime Exclusive Phones venture, which basically subsidizes the price of new unlocked phones by putting Amazon apps and ads on your lockscreen. It's the Kindle Fire approach applied to non-Amazon devices. 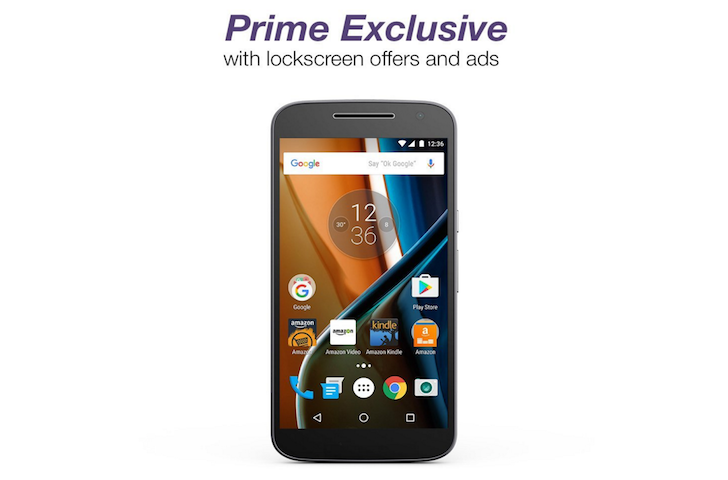 If you head over to the Moto G4's Amazon page, you'll see two different versions of the phone: Prime Exclusive - With offers and ads, and Standard Version - Without offers and ads. If you're a Prime member, you can pick the first option and that reduces the price of the Moto G4 by $50 to $149.99 for the 16GB version and $179.99 for the 32GB version. This $25 off only seems to apply to the offers and ads version of the Moto G4, not the standard one, so you'll have no dice trying to reduce the price without suffering from Amazon's lockscreen ads and apps. Here are the promotion's details if you want to read the fineprint. Check them out, read David's explanation on the deal with the devil that this is tempting you to take, and then make your choice and do it fast. The additional $25 off won't be here for long and you know you deserve it for what you're about to suffer each time you unlock your phone.